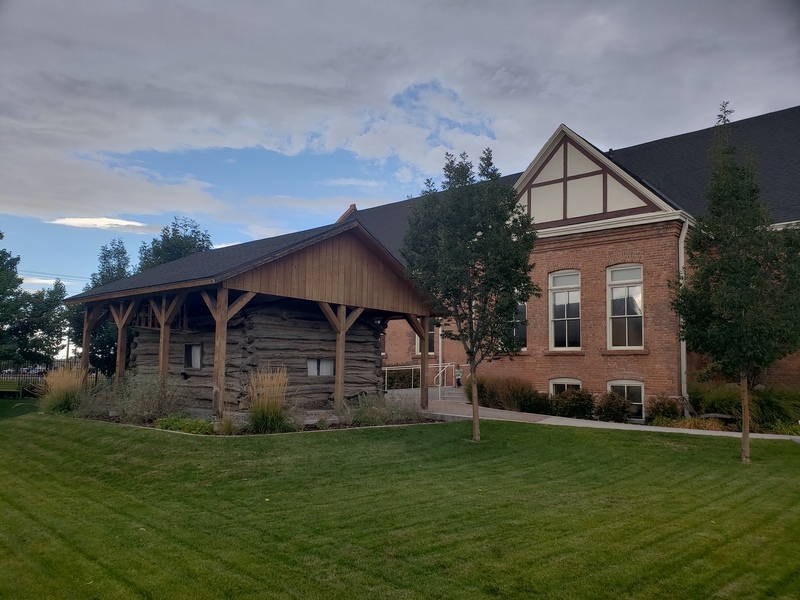 The only cabin surviving from the fort/trading post built in 1848 by Miles Goodyear is now located near and operated by the Weber County Daughters of Utah Pioneers Museum in Ogden. Miles Goodyear (1817 - 1849), who had been many years involved in the Rocky Mountain fur trade, built a post in 1846 on the Weber River about two miles above its junction with the Ogden River. He called it Fort Buenaventura after the mythical river flowing from the Rockies to the Pacific, which had appeared on maps of the West since the 1776 map drawn by Miera y Pacheco on the Dominguez-Escalante expedition. The fort consisted of about half an acre enclosed with pickets, a log house at each corner of the enclosure, and adjoining corrals for the livestock. The fort was occupied by Goodyear, his Ute wife Pomona, their children, other trappers, Indian helpers, and visitors. Goodyear hoped to use the fort as a base for trapping and trading, and of service to overland emigrants. In July 1847, Goodyear visited with the first company of members of The Church of Jesus Christ of Latter-Day Saints traveling west on the Bear River west of Fort Bridger. He tried to entice them to settle on the Weber River. He was unsuccessful, but in November 1847 James Brown was authorized by the LDS High Council of Great Salt Lake City to purchase Fort Buenaventura. Brown and Goodyear agreed on a price of $1,950, and the fort, the outbuildings, and all of the animals except Goodyear's horses became Mormon property. The site became known as Brown's Fort, Brown's Settlement and, subsequently, Brownsville. The name Ogden was bestowed officially in 1851. Goodyear moved to California where he died. Of the original buildings at the fort, only one of the cabins has survived to the present day -- and it has been moved seven times from its original location. In 1857, it was purchased by Amos Pease Stone and used as a blacksmith business. In 1860, Shaw moved the cabin to the banks of Mill Creek. In 1866, it was relocated to 1342 Washington Blvd. A daughter, Minerva Pease Shaw, acquired the cabin in 1896 and relocated it slightly south, near her residence, 1265 Washington. The cabin was then repaired and its dirt roof was replaced with a shingle roof. The cabin made a special appearance in 1916 on a float in the July 24th Ogden Pioneer Days Parade. 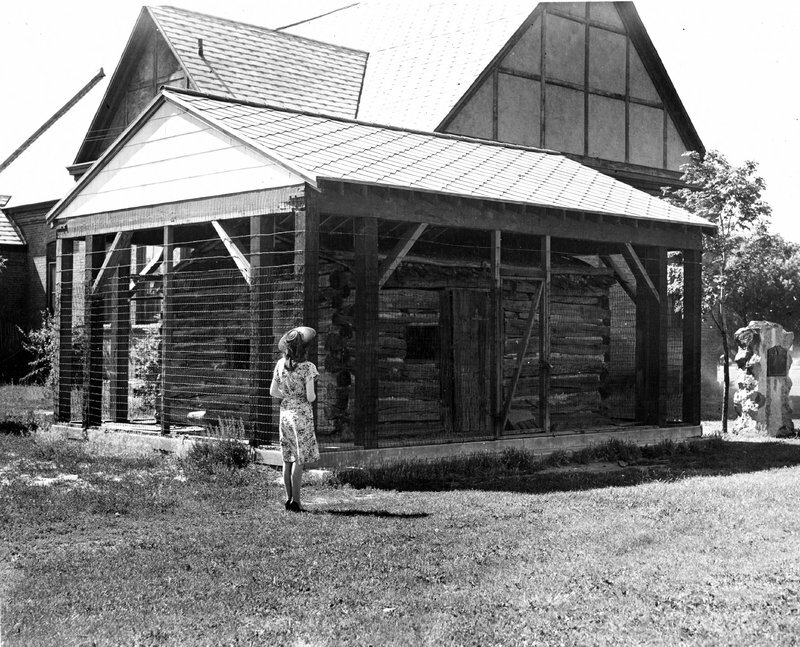 Shaw donated the cabin to the city as a relic hall in 1926. The cabin was transported to the rear of Ogden City Fire Station No. 3, 901 Washington. 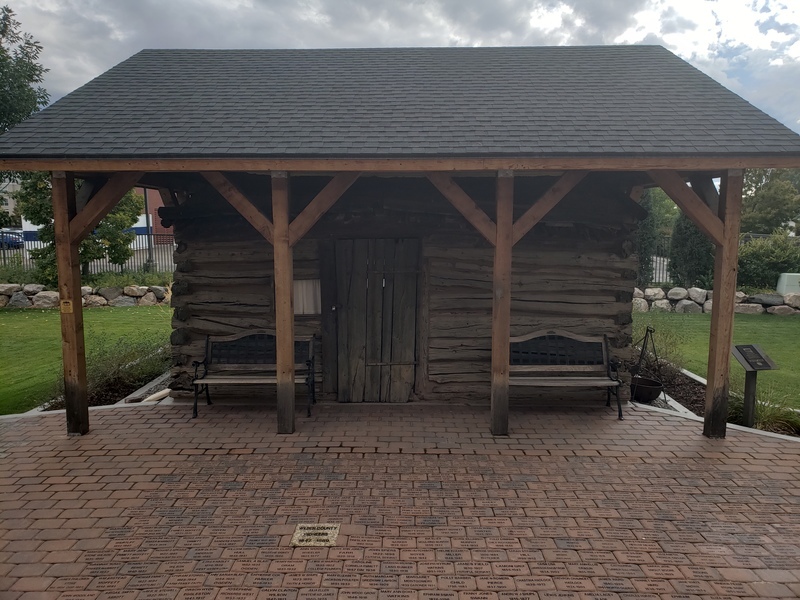 The city of Ogden, determining to take steps to safeguard the oldest house in the state, built a shed over it to protect the building from storms. The cabin was refurbished in 1994-1995. It was dismantled and each of the approximate 500 pieces were numbered. The logs were treated for preservation and a solid rubber membrane was added to the roof, for weatherproofing. The cabin was then reassembled and each log was linked with an acrylic material. Because of the underground parking garage construction for the new Ogden Temple in 2011, the cabin was again moved -- this time to its present location. 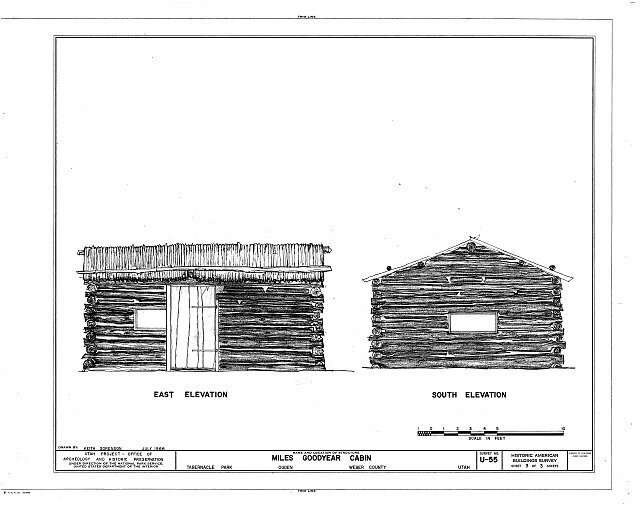 Drawing of Goodyear Cabin from the Historic American Building Survey ~ Source: Library of Congress, Prints & Photographs Division, HABS UTAH,29-OGDEN,2. http://www.loc.gov/pictures/resource/hhh.ut0159.sheet.00002a/?co=hh. 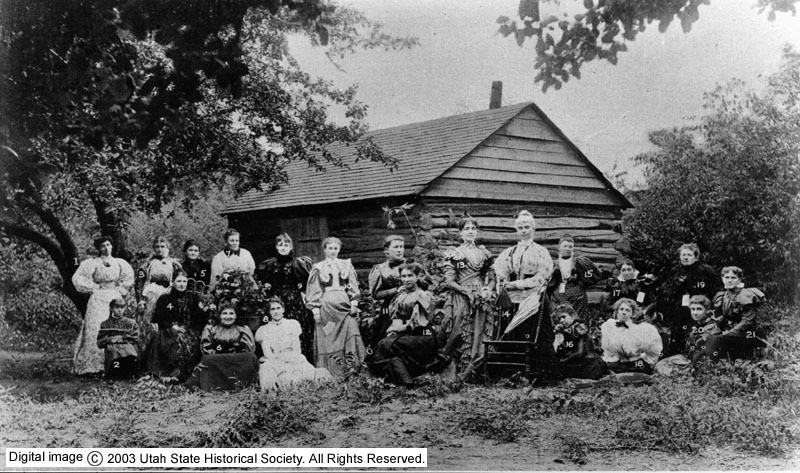 Social Gathering at the Miles Goodyear Cabin: Those pictured are: Mrs. Kuhn, Olive Theresa Shaw, Mrs. Bogue, Mrs. Minerva P. Shaw, Mrs. Ramsford Smith, Mrs. Abe Kuhn, Mrs. D.H. Peery, Mrs. Matson, Mrs. Jeanie Putman, Mrs. I. L. Reynolds, Mrs. Fred J. Kiesel, Mrs. Adam Kuhn, Mrs. Beeford Ijams, Mrs. D.H. Ensign, Mrs. George Brown, Mrs. Agler, Mrs. Albert Kiesel, Mrs. M.H. Spencer, Mrs. Charles W. Chase. ~ Source: Used by permission from Utah State Historical Society, Photo no.11491. https://collections.lib.utah.edu/details?id=430203 . ,” Intermountain Histories, accessed April 20, 2019, https://www.intermountainhistories.org/items/show/273. Arave, Lynn. Standard Examiner. 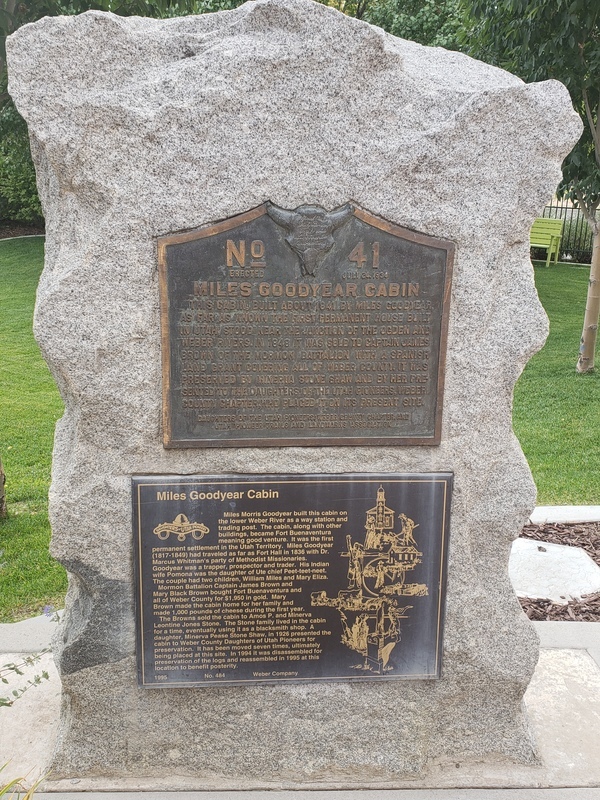 “Goodyear Cabin: Ogden’s Greatest Historical Treasure,” 1 May 2014. Kelly, Charles and Maurice L. Howe. Miles Goodyear: First Citizen of Utah, Trapper, Trader and California Pioneer, Salt Lake City: self published, 1937. Morgan, Dale L. “Miles Goodyear and the Founding of Ogden,” Utah Historical Quarterly (July 1953). National Register of Historic Places, Miles Goodyear Cabin, Ogden, weber County, Utah, National Register #71000866. Roberts, Richard C. and Sadler, Richard W. A History of Weber County Salt Lake City: Utah State Historical Society, 1997.